Four-color process printed on both sides of 14pt C2S Semi-Gloss stock. Coated with High Gloss UV. Home builder Baezley promotes its new creations with this business post card. A starting price and a list of amenities on one side of the card are written on a gray background that blends seamlessly into a photo of a stairwell, as if it's a wall in the home. 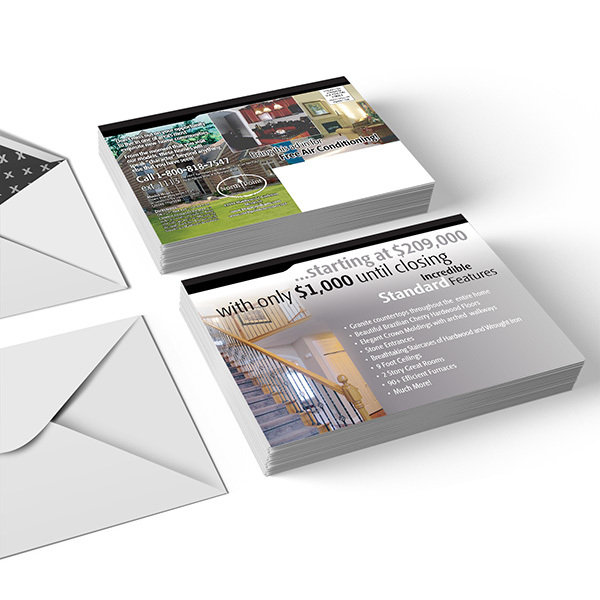 On the flip side, the post card features contact information superimposed over a photo of a home's exterior, with an interior shot in the upper right corner. Four-color process on both sides of 14pt C2S Semi-Gloss stock. Coated with High Gloss UV. 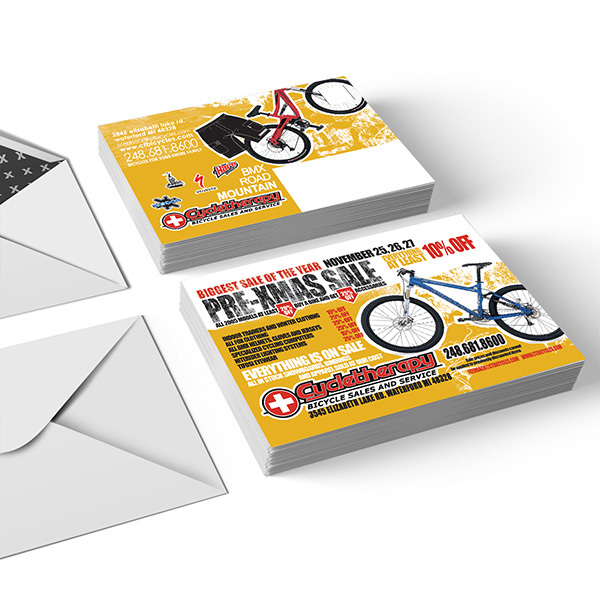 A bicycle props its front tire on the Cycle Therapy logo on this seasonal post card. The tire and handlebars point at the list of discounts available at the bike shop's pre-Christmas sale. On the other side, a group of logos showcases the shop's products. Contact information in the upper left corner is visible without overruling the images. An energetic yellow background gives the design momentum that makes the bikes look as if they're moving. Four-color process printed on both sides of 14pt C2S White Semi-Gloss stock. Coated with Aqueous Gloss. A scenic photo of a mountain trail gives a nod to Cascade Financial Management's location in Colorado and adds a relaxing feel. At right and bottom, readers can find details about the firm's asset insurance. Green and gray blocks separate each section with Cascade's brand colors. 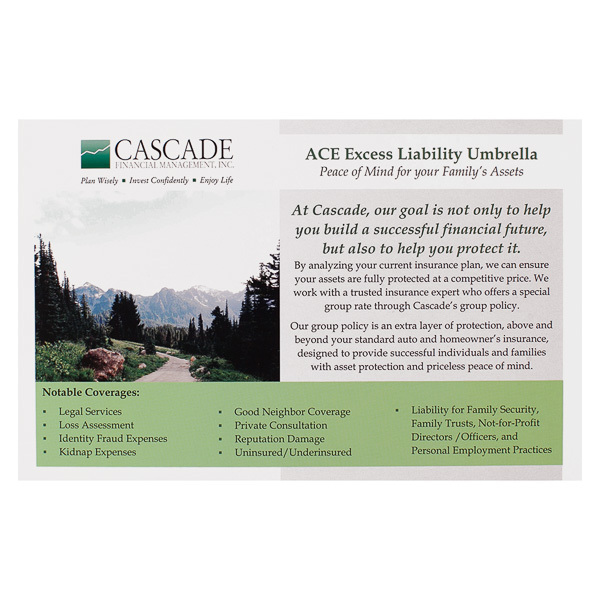 The post card's flip side simply holds contact info, partner info, and a call to action on a plain white background. Its logo at the top reinforces the brand's identity. This 5 1/2" x 8 1/2" product is small enough to slip easily into a full presentation packet, yet large enough to distribute solo. Printing in portrait orientation creates a narrow canvas suited to long blocks of text or thin images, while landscape orientation opens up space for wide photos or multiple columns of text. Make your design pop with bright colors, custom graphics, or branded design elements. Dimension Closed: 8 1/2" x 5 1/2"